Horsham have retained ‘all they wanted’ of last season’s squad and are running the rule over their last few trialists ahead of their friendlies starting. The Hornets have had a handful of pre-season training sessions so far, with the hope of more additions to come in the next few weeks. 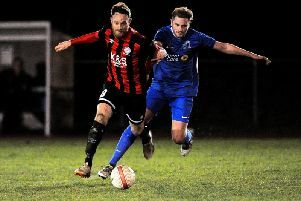 Dominic Di Paola will cast an eye over the last few this weekend in a practice match on Saturday ahead of their first friendly with Horsham YMCA (at Steyning Town) on Monday night. The manager has hinted that more of last season’s squad have put pen to paper - the latest being George Landais, Steve Metcalf Tony Nwachukwu - and they will be ready to announce more news next week. He said: “Four or five trailists asked to come down and one or two have been let go. The others are still with us. It’s all a little up in the air and we will wait and see how it pans out. “We have signed most of who we wanted to sign, but we are just trying to wait for this weekend. There’s a practice match and the first friendly and then we will have a good idea of where we are. The Hornets also signed a National League experienced defender from Welling United earlier this week.